"'All self-knowledge begins in the shadow's black rooms. Enter those rooms, Anna. Address the shadow face-to-face. Ask your questions. Listen to the answers. Respect the answers. The shadow will tell you everything. Why it is you hate. Who it is you love. How to heal. How to sit with sadness. How to grieve. How to live. How to die.'" I thought this was a very solid book—I'd put myself squarely between Andi's resounding "meh" and Monika's breathless amazement. In lieu of more fleshed-out review from me, I'm going to share a few blog posts that summarize my thoughts and feelings about this book much more eloquently than I can. Leah @ Books Speak Volumes wonders if an ill-chosen comparison to a classic novel (on the dust jacket, no less!) might wreck the Hausfrau experience for some readers. I'd had the relevant plot point spoiled for me before I read, but I do wonder if I'd have been surprised had I gone in blind. April @ The Steadfast Reader reflects on the novel's portrayal of depression and its lack of an "easy fix." As you might guess from the quotation I chose above, this resonated with me as well. Shannon @ River City Reading thinks that lovers of Hausfrau might dig Showtime's The Affair. The trailer she included might have had me fanning myself. Heeeey, McNulty, you're looking good these days. Amanda @ Gun in Act One really didn't like Anna but found her story compelling anyway. Anna certainly had her unsavory traits, but I think unlikable characters bother me the most when they also seem unrealistic. Anna felt very real to me. Still itching for more thoughts on this one? Check out the extensive, spoiler-filled discussion over at The Socratic Salon! 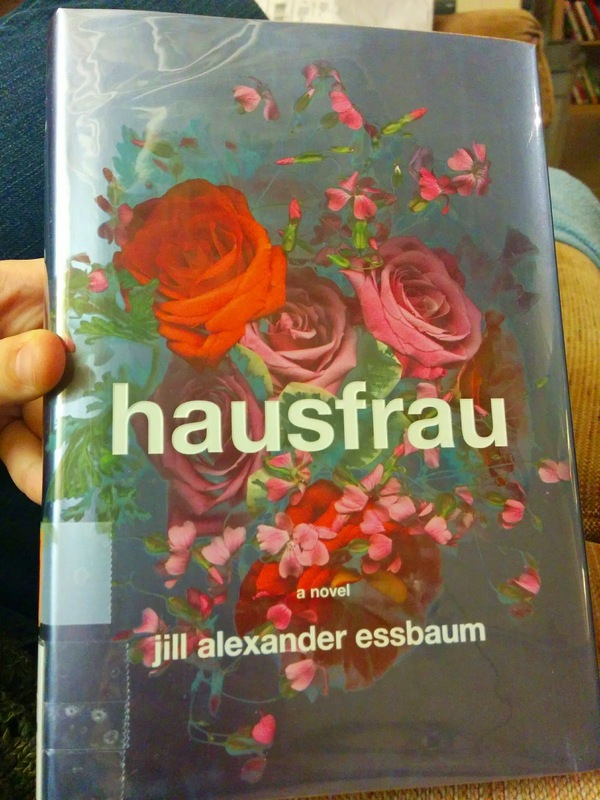 Have you read Hausfrau? What did you think? I haven't read it yet, although I wish I had, just for the fun of joining in at the Socratic Salon! Thanks for putting together all these links! I loved this, but I'm a sucker for great writing and I couldn't resist the ways it made me think. And yes...you need some steamy McNulty very soon. But be prepared to hate him a little. Yes, I saw your review. I agree that not feeling anything for a character would be frustrating—I'm surprised you went back and made yourself finish! And oh boy, it sounds like I need to schedule a date with Showtime. Thanks for sharing this round-up! I've loved seeing all the different angles people have used to discuss this book. Sounds very thought provoking. I need to pick this one up myself soon. I do love the quotes you've chosen even if I think I'd be a bit afraid of my answers to those same questions. I swoon just reading steamy McNulty. I so need showtime. Sorry for the late reply! I really enjoyed all the different points, too. It's a fairly straightforward story, but sooo much lurks beneath the surface that's worth chewing over. It was a quick read, if you find yourself with the time! My Month in Reading (and More): So Long, April! #ReadingMyLibrary Challenge: Week Four Update! It's Monday, April 20! What Are You Reading? #ReadingMyLibrary Challenge: Week Two Update! #ReadingMyLibrary Challenge: Week One Update!